MHO has a range of modules to manage different functions across your healthcare organization such as emergency care, hospitalizations, laboratories, outpatient care, as well as administrative and financial tasks. With MHO modules your organization’s practitioners can record relevant information as they provision care to their patients. This information is stored permanently and securely on the patient’s electronic medical record (EMR) and is made available to healthcare practitioners at the points of service to ensure effective quality care. See below a brief description of the principle modules of MHO. Manage patient administration admissions and discharges for ambulatory, emergency and inpatient services. Manage transfers of patients across your services in your healthcare enterprise. Manage appointment scheduling for all outpatient, odontology and ancillary services across your healthcare enterprise. Take appointments from patients in person from within your facilities, over the phone via a call center, or from healthcare practitioners during patient encounters via lab tests and diagnostic imaging orders. Schedule appointments for patient surgical procedures; manage waiting lists for each operating room at your facilities; schedule emergency surgeries for patients in need of immediate attention. Maintain a master patient index across your entire provider network. Avoid duplicate patient records; merge patient data from multiple providers. Provide a single view of a patient and implement a unique patient identifier across your healthcare territory. Connect MHO to local government registries of citizens to support the identification process of subjects and ensure patients are uniquely identified across your healthcare enterprise. Manage your ambulatory care practice with MHO. Manage patient visits, create lab and radiology orders, prescribe medicine, create treatment plans, document problems and diagnosis while saving data on the patient’s EMR. Physicians can place orders, prescribe medicines, create working sheets for nurses, document problems, progress and diagnosis. Nurse can fulfill orders, record vital signs, administer medicine and more. Manage your emergency care department with this module. Prioritize care based on triage severity level and on the patients clinical history, place orders for tests and procedures, monitor patient vital signs, assign tasks between nurses and physicians, manage the distribution of patients across your emergency department. Includes an array of modules for nurses to carry out daily tasks for emergency, outpatient or inpatient departments. Orders created by physicians for nursing to fulfill appear on the Nurse’s desktop to streamline patient care and workflow. Streamline care with the Physicians Desktop managing clinical aspects of patient encounters. Physicians access modules for emergency, outpatient, inpatient and surgery functions. Includes the physicians calendar with appointments scheduled, access to lab and radiology results ordered for patients, diagnostic support functions, consults, order placement and access to the patient’s medical record during encounters. Manage lab tests and results conducted by providers either inside or outside the healthcare center. Calibrate & control medical devices, read data from autoanalyzers and save to the patient’s EMR. Schedule tests, manage samples and test results, and process statistics of histopathological analysis. Schedule tests & procedures, enter orders, write radiology reports with images and save them directly on the patient’s EMR. Interoperable using DICOM standards and connects with PACS systems. Manage your blood bank including donations, lab analysis, shelf life, stock levels, movements and administration to patients. Control pharmacy stock including shelf life, orders, movements, prescriptions, dispensation and administration to patients. Manage your stock throughout your organization, across mulitple store rooms and healthcare centers. Order and receive materials from vendors, manage returns, register stock movements between stores, record adjustments, manage shelf life and view current inventory levels. Avoid downtime and manage preventative and corrective maintenance of all your hospital equipment and facilities. Plan periodic maintenance, request emergency maintenance, trace parts and labor used for each repair and maintenance job. Manage the people across your healthcare organization. Plan shifts, leave and access control for all your healthcare practitioners and staff. Manage accounting across one or more cost centers throughout your healthcare organization. Record accounting activities, manage charter of accounts, enter accounting periods, conduct cost center comparison analysis, and produce balance sheets and cash flow reports. Easily manage receivables from multiple payers including: insurance companies, healthcare authorities and/or direct partial or full payments from your patients. Centralize purchasing for all your healthcare centers. Manage vendors, enter tenders and quotes, make purchase requests, process orders and execute accounts payables. Manage payments and cash within your organization. Control cash adjustments, movements, pay vendors and reimburse employees. Process the payroll for all your healthcare practitioners and staff throughout your healthcare organization. Manage payer information such as insurance companies and their plans. View key performance indicators of functions within your healthcare enterprise so you can quickly identify areas of your operations that require attention. Audit data across the whole organization and ensure your security policies, operational standards and quality guidelines are continuously maintained. View vital statistics of each operational unit of your healthcare organization, whether it is clinical or administrative. Create and save custom queries and reports. Use our range of standard reports or create your own custom reports from the many data points included in MHO so you can manage clinical and operational aspects of your healthcare organization. Setup alarms so that you are continuously alerted when certain events occur across your operations. Manage interoperability functions so MHO can communicate with third party systems and other providers in your healthcare network. Develop custom reports that provide valuable insights to your healthcare organization. Protect patient data and your information assets. Control access to MHO by assigning roles to each user, apply cryptography policies to data elements and enable secure transport layers. Localize and set up MHO to work with your healthcare facilities. MHO includes a vast array of settings including hospital departments, services and layouts, patient characteristics for administration purposes, geographic data, barcodes, units of measure, and more. Manage settings for MHO modules and adapt them for your healthcare organization and hospital. 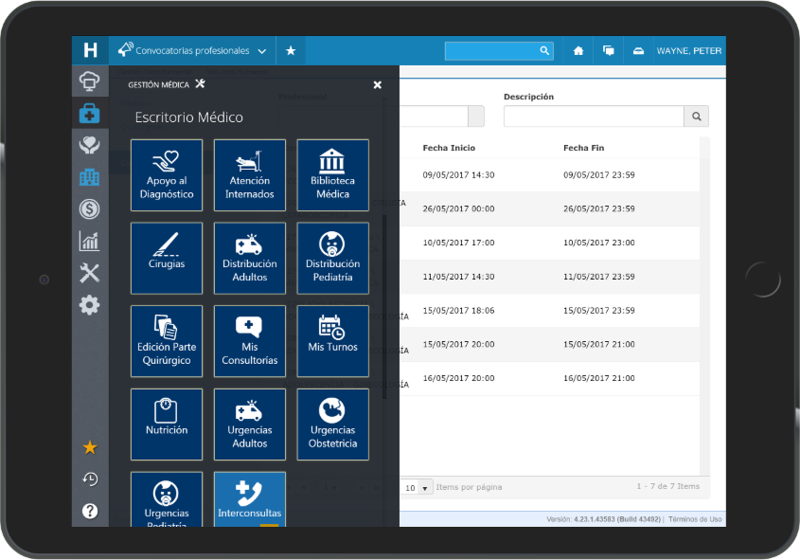 Configure settings for patients, appointments, inpatient functions, ancillary services, storerooms, employees, billing functions and more. Manage users of MHO assigning them to groups and giving them roles. Provide users with secure access to MHO and comply with local privacy laws related to accessing patient records.